The standard inverter option for rooftop solar panel systems has historically been the “string” inverter, in which all solar panels in the system are connected to a single inverter. Thanks to advances in solar technologies, more solar installers are offering module-level power electronics (MLPEs) as an alternative to string inverters. As you shop for your solar power system, there are two MLPE options for you to consider: micro-inverters and power optimizers. Better-optimized performance: If some of your solar panels are shaded for part of the day, or are installed at different angles, the performance of the entire system will suffer if you have a string inverter. MLPEs are better able to handle variations in performance between individual panels. Performance monitoring: With MLPEs, unlike with string inverters, you can monitor the performance of solar panels individually. However, as is often the case, these benefits come at a price. Systems that use micro-inverters or power optimizers are generally more expensive than systems that use string inverters. Solar technologies: Do you need micro-inverters or power optimizers? Both micro-inverters and power optimizers promise certain advantages over string inverters, but they’re not necessary for every solar installation. They offer the most value if your roof is shaded or if the panels will be installed on roof surfaces with different orientations. Learn more about the advantages and disadvantages of micro-inverters and power optimizers. Once you decide to install a solar energy system with MLPE equipment, the next step is to determine which solar technology best suits your needs. Consider warranties, operating temperature range, and efficiency when comparing your micro-inverter and power optimizer options. Warranties provide a good indication of the reliability of a company’s products, and are readily available on the websites of most micro-inverter and optimizer manufacturers. All major MLPE companies highlighted below offer 25-year warranties on their micro-inverters and power optimizers. Companies may require other products, such as communications gateways or central inverters, for their MLPE systems to function properly. These devices may have separate warranties, which are generally shorter than those of the micro-inverters and power optimizers. Additionally, while a warranty covers parts, it may not include other costs associated with replacement, such as shipping and labor to replace a product. Confirm these terms with your solar installer. The operating temperature range of a micro-inverter or power optimizer indicates the temperatures at which the device can safely operate. The range does not refer to air temperature around the solar panels, but rather the temperature of the device itself. Micro-inverters and power optimizers are electronic devices, and are sensitive to heat just like your phone or laptop. They have been engineered to keep themselves cool but do produce a small amount of heat during normal operation. Because they are typically located outside, they are more exposed than most electronics to extreme heat. For this reason, higher operational temperature ranges are preferable. For MLPEs, efficiency measures how well a device converts electricity from one form to another. In the case of micro-inverters and string inverters, this refers to converting DC electricity from solar panels into AC electricity for home use. In the case of power optimizers, it refers to the conversion of DC electricity from one voltage to another before it is sent to an inverter for DC-AC conversion. Peak efficiency refers to how well a device performs in ideal conditions, when your solar panels are producing power at their maximum capacity. It can help you understand how much power is lost during conversion, and is comparable to the maximum miles-per-gallon fuel economy of a car. Weighted efficiency takes into account fluctuations in solar panel output throughout the day. It is an indicator of how well an inverter will perform in the field and how much electricity you can expect your solar PV system to produce. Weighted efficiency is comparable to an average fuel economy calculated using the fuel economies of both highway and city driving situations. Micro-inverters perform the same function that a centralized string inverter does: They convert the DC electricity from your solar panels into appliance-friendly AC electricity. However, unlike string inverters, solar energy systems with micro-inverters will have an inverter installed for every panel, so the panels operate independently of one another. Enphase Energy is the largest micro-inverter manufacturer in the US. Enphase’s micro-inverters are mounted on the racking behind your solar panels. There is one micro-inverter per panel. They are compatible with many solar panel brands and models. Although a much smaller player in the U.S. residential solar market, SolarBridge is owned by SunPower, which is one of the largest solar panel manufacturers in the United States. As a result, SolarBridge’s micro-inverters are typically paired with SunPower solar panels. Review company profiles on the EnergySage Supplier Search, or discuss them in our Q&A Forum. Solar panel systems that use power optimizers also have one device installed per panel. The power optimizer “conditions” the power from each panel individually to maximize overall system performance. However, systems that use power optimizers still require a central inverter to convert the DC electricity into AC. SolarEdge is the global leader in power optimizers based in Israel. 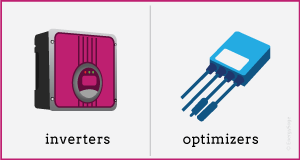 The company’s optimizers are used with its proprietary string inverters. Tigo Energy’s power optimizers can be combined with various brands of inverters and solar panels. According to the company, Tigo’s residential market share was about 10 percent in 2014. You can further research micro-inverter and power optimizer manufacturers in EnergySage’s supplier search, ask questions about them in our Q&A Forum, or compare quotes from high quality, prescreened solar installers in your area who offer these options by shopping in the EnergySage Solar Marketplace. In the table below we have detailed the key metrics for each of the three largest MLPE manufacturers in the US residential market and SolarBridge. We have also included other useful information about each company and its products.